MK Tibi in Ottawa: Settlements are a cancer spreading all over Palestinian land. Boycott products manufactured there. 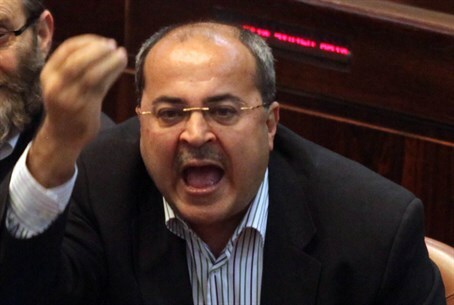 Arab MK Ahmed Tibi, notorious for making statements against Israel while he serves in its parliament, has called for a boycott of products manufactured in Judea, Samaria, and east Jerusalem. Tibi made the controversial comments during a visit in Ottawa, Canada, on Monday. According to a report in The Montreal Gazette, Tibi also said he was aware that his remarks were a direct violation of the boycott law approved by the Knesset last July, though he seemed unfazed by that fact. The boycott bill prevents companies from participating in government bids if they take part in a boycott of a business in Israel. It stipulates that anyone calling for an economic, cultural or academic boycott against the Jewish communities in Judea and Samaria will be unable to participate in government tenders. In addition, any person who considers himself a victim of a boycott could sue the boycotter for compensation. Tibi, who served for a time as an adviser to the late Palestinian Authority Chairman Yasser Arafat, noted in Ottawa that successive Canadian governments have turned a disapproving eye on Jewish construction in Judea and Samaria. “But it seems that the Canadian government is not willing to differentiate between, for example, products coming from settlements and products coming from Israel,” Tibi said. Tibi’s long history of anti-Israel activities includes going to New York to be a part of the Palestinian Authority’s delegation to the United Nations when it presented its unilateral statehood bid last September. Last January Tibi praised the Palestinian Authority’s “martyrs” at a ceremony held on the occasion of "Palestinian Martyrs Day” and sponsored by PA chairman Mahmoud Abbas. After the boycott bill was passed last July, Yisrael Beiteinu MK Alex Miller said he would be the first to utilize it against none other than Tibi, after the latter called for a boycott of the city of Ariel. "Tibi's party is not immune to lawsuits and certainly is not above the law," Miller, an Ariel resident, said. "Whoever shows contempt for the law and stomps on it will be responsible for the outcome," he added. Miller explained that the law is meant to prevent economic damage caused by boycotts, and that Tibi's words could make investors hesitate before doing business in Ariel.